But not every dispute is a criminal matter. Sometimes it is simply a dispute between individuals. These cases are resolved in civil court as opposed to criminal court. It is the best interest of society to have disputes resolved in a civil court. In everyday life, an “eye for an eye” would lead to chaos. Imagine Florida without civil courts to resolve disputes. You get injured in a car accident in Miami and you end up with medical bills. Without a civil court, your only recourse is to injure the other person? If you were hurt when you slipped and fell in a supermarket, do you burn the place down to get back at them? If a doctor commits medical malpractice and leaves you with a severe injury, do you then find the physician and hurt them the way they hurt you? This would be total chaos. That is why we, as a civilized society, need a civil court to resolve disputes. So the question then becomes in civil court what is the burden of proof. Should it be the same as what the government must meet when your life or liberty is at risk? The answer is no. Florida has long used Model Jury Instructions to guide jurors in deciding cases. The chart below is often used by criminal defense attorneys in trial. After reading these jury instructions it is clear that much is required of the government to convict someone of a crime and to take their life or liberty. In civil cases, the burden is simpler because the stakes are not nearly as high. In civil “greater weight of the evidence” means the more persuasive and convincing force and effect of the entire evidence in the case. Now what does that mean? It has been described as a tipping of the scales or more likely than not. Consider this: if your kids are fighting over something and they run to you to determine who is right and who is wrong. Do you decide that dispute based on which child has proved his/her case beyond a reasonable doubt? Or more likely than not? If you are a teacher and have to resolve a dispute between students what standard do you use – beyond a reasonable doubt or a tipping of the scales? What if you are a manager and there is a disagreement between your employees? As a reasonable manager, you try to resolve it, but if you have to make a decision then you most likely go with the employee who has proved their position by the greater weight of the evidence or the more persuasive and convincing force and effect of their position. We make these types decisions each and every day. We do not make decisions on who loses their life or liberty every day. In civil court, jurors are asked to resolve disputes. They are not asked to decide life or liberty decisions. 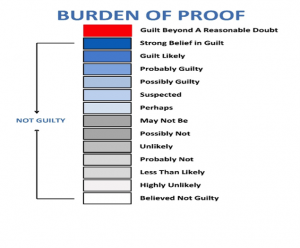 That it is why the burden of proof is different and why it makes sense.